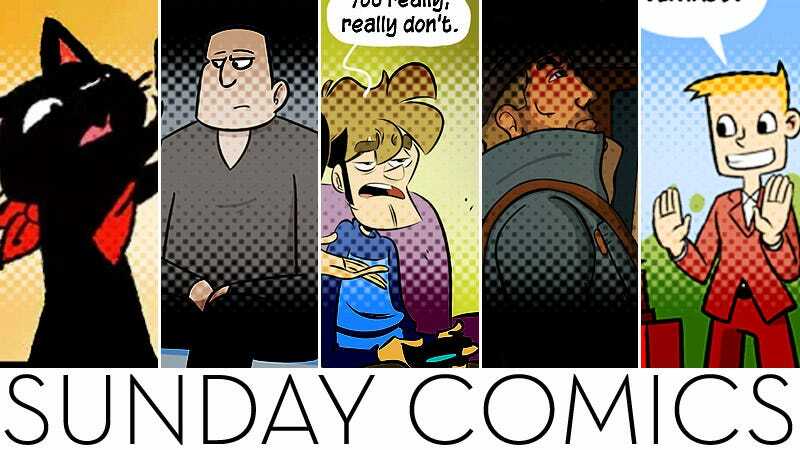 The time has come for another edition of Kotaku’s Sunday Comics, your weekly roundup of webcomics. The images enlarge if you click on the magnifying glass icon. Awkward Zombie by Katie Tiedrich. Published October 29. Read more of Awkward Zombie. Corpse Run by Alex Di Stasi. Published November 1. Read more of Corpse Run. Double XP by M.S. Corley and Josh Crandall. Published November 2. Read more of Double XP. The GaMERCaT by Samantha Whitten. This is a guest comic written and drawn by Ethan Ror. Published October 29. Read more of The GaMERCaT. Life in Aggro by Fei Hsiao and Cecilia Vasquez. Published November 4. Read more of Life in Aggro. Nerf NOW!! by Josué Pereira. Published November 3. Read more of Nerf NOW!! Penny Arcade by Jerry Holkins and Mike Krahulik. Published November 2. Read more of Penny Arcade.